Old Art lesson: (Done 6 years ago, not used in 2008.) Create eggshell mosaic crosses to celebrate the truth of the resurrection. Cooking: Make footprint shaped sugar cookies. Discuss how Jesus walks with us on our faith journey. Newsroom: Film a news report with participants in the story. New Science: Through a demo & hands-on exercises, explore the concept of how we view objects around us. Discuss “seeing” or recognizing Jesus. Old Science: (Done 6 years ago. Not used in 2008.) It’s hard to recognize Jesus. Optical illusion and slight of hand magic tricks open discussion on how things are not always what they appear. Art: Create a banner made from painted footprints. Discuss how Jesus walks with us on our faith journey. Drama: Be a part of the scene where Jesus broke bread. Learn about Communion. Name that the story is found in the New Testament in the Gospels. Re-tell in his/her own words the Walk to Emmaus story. Draw parallels between the idea of the disciples walk with Jesus and our own continuing faith journey. Examine the concept of recognizing Jesus; how we “see” Jesus today in our lives. Discover that Jesus revealed himself in breaking the bread and continues to be revealed in the Sacrament of Communion. Refer to the Bible background written by Rev. Neil MacQueen for the Rotation.org Writing team. To understand that we celebrate Christ’s resurrection. To know that Jesus appeared to his followers after his crucifixion. They didn’t always recognize him immediately but once they did, this helped them understand and believe the resurrection. Introduce yourself. Pass around the attendance…etc. Open class with prayer if you desire—ask first for prayer requests then ask if someone else would like to lead the group in prayer. Be prepared to say a prayer yourself, working in prayer requests. Say: These women who went to the tomb actually saw the risen Christ. They actually saw Jesus! He had been killed but now he was alive! In fact during the 40 days after his resurrection, Jesus appeared several times to his disciples. They had meals with him and talked to him. Today our story is about two people who also met the risen Christ. Let’s read our story. Help the kids find Luke, chapter 24, verses 13 to 35. (Encourage kids to bring their own Bibles!) To maximize art time you should read the story. It is still very important though, for the kids to find the place in their Bible, and follow along. In week 2 and 3 you might try asking them to tell you the story. Or you might start reading and then ask—what happened next? These two disciples that had walked the seven miles to Emmaus were so excited that they went all the way back to Jerusalem even though it was now night time. They couldn’t wait to tell the other disciples. Jesus was alive. Ask: How do you feel knowing that Jesus is alive? (accept all answers) At Easter time every year we celebrate the resurrection of Jesus. But this is something we can celebrate everyday. To help remind us of the joy we feel because of Easter, let’s make egg shell mosaic crosses. Give everyone a piece of the card stock paper. Have them write their name on the back. Pass out the other supplies. Show them how to use the paintbrush to apply glue to a small area of the cross and then glue on eggshell pieces. Use a toothpick to move shells to desired location on the cross. Allow to dry completely before handling. Say: It’s not very nice to think about, but the cross was actually an awful death for Jesus. Crucifixion was a cruel form of punishment. It often took 2 to 4 days for a person to die. Jesus died much quicker than usual, in less than a day. In the early Church, the cross was not used at all as a symbol, because it was such a gruesome reminder of the cruel way Christ had to die. It was not until 5th Century, when Roman rule had passed and the personal memory of crucifixion had ceased, that the cross became a symbol of the Christian Church. The cross is a symbol today because we have come to know the cross was not the end of the story. We now see the cross as a symbol of hope and new life. Jesus died to pay the price for all our sins. Remember we learned in a previous rotation about what sin is? (anything that separates us from God) This means that when we sin, we can ask for forgiveness and know that God loves us and forgives us. Nothing can separate us from God’s love. Ask if anyone would like to lead the group in prayer. Say a prayer yourself if no one volunteers. A suggestion: Thank you God for Easter every day. Thank you for helping us to recognize you, with us in our lives. Amen. Have the kids help with clean up – putting extra eggshells back into zip bags, etc. Copyright 2002 First United Methodist Church, Ann Arbor, MI. For scripture and objectives - see above. Read and be familiar with the version presented in the Children’s Bible in 365 Stories page 380 so you can read it with animation and in a storytelling fashion. How about anyone who walked with Jesus AFTER he died? Say: We are going to hear about Cleopas and a friend (who might have been his wife, we don’t know)… anyway, they told of doing this – walking with the risen Christ. Listen for the point in the story at which they realized that the person walking with them was Jesus. I wonder what took them so long to notice… ? Say: This story is found in the Bible in the book of Luke. Let’s get out Bibles and share with a friend to see if you can find Luke. Say: Let’s find Luke 24:13-35. Okay, hold this spot open as I read this as a storyteller would. Start off the story by saying: This story takes place on the very first Easter. Finish the story by Saying: So Jesus’ friends returned to Jerusalem, in the dark, to tell the others about meeting Jesus along the road to Emmaus. Ask: When did Cleopas and his wife realize that it was Jesus? Why do you think it took them so long? Say: Let’s repeat that. Great! Let’s try it again at the end of our time together. Now we are going to make some cookies in the shape of footprints. Footprints, so that we can remember that this story is about walking with Jesus! Say: If you want to, you can make a cookie in the shape of your own foot! Or you can use some footprint cookie cutters that we have in the kitchen. For those of you who want to do their own foot, please take off your shoe. I’m going to give you a square of parchment paper. Stand on the paper and have a partner trace your foot with a pencil. Then write your name on the outer area around your foot. When you are done, put your shoe back on and bring your parchment into the kitchen. Have the Shepherd stay with any children who would like to trace their own foot. Ask the Shepherd to cut the parchment paper into quarters (? is this big enough) for the students to use to trace their foot. Go into the kitchen with those who don’t wish to make their own feet into cookies. You are going to have the children wash their hands and put aprons on. Give students a bit of extra flour to rub onto the tabletop in front of them. Give each child some dough and have them roll it out with a rolling pin. If the students are making their own footprint then shape the rolled dough to fit their own footprint. For those using footprint cookie cutters, they can make a couple of footprint cookies with the cutters. Have them write their name on the parchment paper next to their cookies. Place the cookies made with cutters on a separate cookie sheet from the footprint-sized cookies. The latter will likely take a little longer to cook. What did our key verse say happened to him and his friend/wife? What did they do after they found out it was Jesus talking with them? When ready, bake the cookies for 8-10 minutes. [Set the kitchen timer.] Place the Shepherd in charge of making sure they don’t burn! Have the Shepherd bring the baked cookies out to the Social Hall. Have students wash their hands and return to the tables in the Social Hall. Say: While we wait for the cookies to bake, let’s talk some more about our story. Do you suppose that you would recognize Jesus if you had been walking with him? Do you think there is a way that we can walk with Jesus today – not in person, but in our hearts? Have you been around anyone who seems like a ‘Jesus-kind’ of person? Say: Maybe we can walk with Jesus by learning more about him and how he wanted us to be. We have made footprint cookies to help us think about our walk with Jesus – our journey in learning more about him and our faith in God. When they are cool enough, share the cookies. You could play a quick game of Simon Says (kind of a ‘follow the leader’ type of game!) and incorporate different elements of feet, walking, and repeating the Bible Verse. Have everyone repeat the key Bible verse. See if they remember it without looking it up in the Bible. Say: Let’s have a prayer. Lord, help us to tell others about how wonderful Jesus was and is in our lives. Help us to learn more about you through him. Help us on our walk with Jesus. Amen. Batchelor, Mary. The Children’s Bible in 365 Stories. Batavia, IL: Lion Publishing, 1985. Teener,Carol. "The Walk to Emmaus - Cooking." April 2008. Place URL where lesson found inside angle brackets<>. Check to make sure video equipment is set up and ready to use. Make an outline of the class on the easel. Write in bullet form: choose parts/costumes, rehearse the script, pre-production meeting, videotape the newscast, watch the news, discuss: what if they had access to a news show? Label the 5 index cards: Camera operator, News Anchor (Demetrius), Reporter (Jacob), Cleopas, Friend. Greet your students warmly, welcoming them to the WFUMC Newsroom. Introduce yourself and any other adults. Say: This is the newsroom of WFUMC, so we’ll be reporting news from the Bible. Before we get started, let’s begin with prayer. Say: Today we’ll be videotaping a news broadcast on a portion of the story, The Walk to Emmaus. We want to get to the bottom of the story. We want to find out what’s going on, because it’s our job to report the news. Like all newscasts, ours will need reporters and people being interviewed. We’ll get it all ready, practice, and videotape it, and hopefully we’ll have time to watch our news show. Let’s first review our story. Have everyone find Luke - Chapter 24, Verses 13 – 35 in the Bible. Have kids take turns reading verses 13 - 35 out loud. Say: We are going to explore this story by creating a news report. We will choose parts, choose costumes, rehearse the script, have a short pre-production meeting, video tape either one or two groups acting out the newscast (depending on the number of kids in attendance), watch the newscast, and then discuss what people may have felt like back in the time when Jesus was resurrected if they had access to news media. To determine who plays each part, each student will randomly choose an index card. There are 5 cards with one part on each card. If there are 7 or more kids, there should be two groups. After the first group has selected their parts, the second group can do the same. Say: We will now prepare our news show. Everyone will choose costumes and we will run through the script once or twice. You have about 5 minutes to prepare your scene; then we’ll videotape it. As you help the students rehearse the newscast, if it seems appropriate, you can enhance their learning by telling them what you learned from the Overview material. When the time is up, gather everyone together for a quick pre-production meeting. Decide where each actor will be sitting/standing. Make sure the camera is in place, power is on, tape is in camera, lens cap if off, recording (camera) mode is selected. Decide how the actors will be signaled when the scene is being started or stopped. Run through the script as rehearsed, but now with the camera going! Make sure that all of the spectators are sitting down quietly during the taping of the newscast. If there are two groups, instruct the first group to leave “the set” and ask the second group to take their places. Then begin the second taping. If there is a still camera available, the workshop leader or shepherd could take a few still photos for our website. When done taping, eject the tape from the camera. Pop it into the VCR and rewind. While the tape is rewinding, have the kids help you tidy up the workshop space and put costumes back. Now, enjoy viewing the creation! How might people in Jesus’ time have reacted after seeing this news report? Why do you think Jesus did not tell Cleopas and his friend who he was until they realized who he was when he broke bread with them? How did Cleopas and his friend feel when Jesus was walking with them? How we might recognize that Jesus walks with us today? In what ways can we see Jesus in the lives of others? Marshall, Jan. “Rotation.org The Walk to Emmaus: Lesson Set from Brookhaven Church.” 2002. Pascoe, Beth. "The Walk to Emmaus - Newsroom." April 2008. Place URL where lesson found inside angle brackets<>. [Note: 4th – 6th graders visited this workshop.] Through demonstration and hands-on exercises, children will explore the concept of how we view objects around us. Students will discuss “seeing” or recognizing Jesus. What can make it difficult to recognize Jesus in our midst? Examples of “Magic Eye” Puzzles (Check out your public library. Print outs of puzzles – (suggested 3 for 1st & 2nd grade, 5 for 3rd and up - see resource list). Use the Internet to access examples of visual puzzles or illusions. Hint - Don’t use too many puzzles or kids won’t be ready to move to next station. If a puzzle has an “answer,” include the answer but have it covered up. Index cards, 3" x 5" -- On each card, draw a dot on one end (about 2 cm in) and draw a cross on the other end. On one of the cards draw a line across the entire card through the center of the dot and the cross. Paper and pencil -- Trace circles on paper using the lid. Cut out. Color circles in a variety of ways – example a circle that is half yellow and half red or a circle that is half yellow and half blue. (Try other combinations). Use a hammer and a nail to punch a small divot in the center of each lid (this makes the lid into a simple spinning top). Tape the papers to the lids. Use the Internet to print out a “dot picture” (see Resources) or create your own. Attach it to a clipboard. In the center of a sheet of copy paper, trace around a penny. Carefully cut an exact penny-sized opening. Practice how to pass the dollar coin through the penny-sized hole. Determine the experiment stations you intend to use. 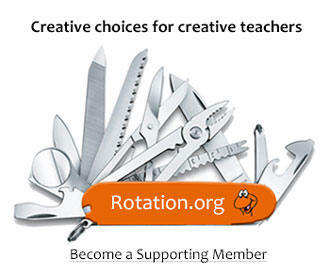 (You may choose to do fewer stations if time is limited or the size of your class is small.) Set up the experiment stations with supplies. Try out each of the experiment stations for yourself. Print instructions for each station to be used (see below). Using a word processor, create a customized worksheet for the stations selected (see below). Leave space on the sheet for students to write their answers. The worksheet isn’t required but keeps the kids focused on the lesson. Print one worksheet copy per student. Worksheet Words: (1) Was this hard or easy to do? (2) Why do you think so? (3) If you practiced at this sort of exercise, would it get easier? Station 2: “Magic Eye” puzzles. Printed Instructions: (1) Hold a picture so the center of the picture almost touches your nose. (2) Look at the picture without focusing on any one part. Slowly move the picture away from your face. Keep your eyes relaxed and unfocused! Worksheet Words: (1) What does the picture look like when you look at it in a normal way? (2) What did you see when you followed the instructions? (3) If you try looking at the same picture again does it get easier to see the “surprise”? Printed Instructions: See if you can solve the puzzles shown. Worksheet Words: (1) Was each puzzle hard, or easy to do? (2) If the puzzle had an “answer”, when you saw the answer did the puzzle then seem really easy? (3) What surprising thing did you learn? Printed Instructions: Using the card with just a cross and a dot, with the cross on the right, hold the card so it is an arm’s length away. Close your right eye. Look at the cross with your left eye. Focusing on the cross, slowly move the card towards your face. Keep focusing on the cross but notice what happens to the dot. Worksheet Words: (1) What happened to the dot as you moved the card in closer? (2) Does the same result occur if you close your left eye and focus your right eye on the dot? (3) If you try this experiment using the card with a line across it, what do you notice? Printed Instructions: Predict what you’ll see before you spin each lid. Worksheet Words: (1) What colors did you observe? (2) What color would you expect to see when spinning a black and white disk? (3) What about a multi-color disk? Printed Instructions: Look at the picture – first close up, then from across the room. Worksheet Words: (1) When looking close up, can you tell what the picture is? (2) What about from far away? (3) Your brain is always (well, mostly always) trying to make sense of what you see. What do you think your brain is doing in this case? Greet your students warmly, welcoming them to the Science Workshop. Introduce yourself and any other adults. Open with prayer. A suggestion: “Dear God, We are thankful that long ago you sent your son Jesus to teach people about your love. Help us today to recognize the love that Jesus offers for each of us. Amen." Ask: What if I told you that sometimes you and I might see the same thing, but it would mean something very different to both of us? Would you agree that could happen? Say: In Science, we ask a question, make a guess at the answer, and then we test out our guess with experiments. Let’s do a little experiment. Do: Distribute a piece of paper and a pencil to each student. Say: I will give you some instructions and you will draw on the paper what you hear me say. Say: Let’s test out our guess. You have one minute to draw an animal with four legs, two ears and whiskers. After one minute of drawing time, continue. Say: I’m going to count to three and everyone will show the group their pictures. Ready? One, two, three. Take a moment to look at the pictures. Ask: Do we all have the same drawing? What are some of the drawings we have? But, didn’t we all hear the same directions? Why is it that we have different drawings? Say: We are learning a Bible story about two people who were walking from Jerusalem to the town of Emmaus. This took place on the very first Easter. Say: It is early evening on the very first Easter -- on the day Jesus rose from the dead. So far just a few of the women have seen Jesus alive. They have told the other disciples what they saw but the other disciples didn’t believe these women. They didn’t know what to think. Ask: Since our story took place on the very first Easter, where would we find our story? Say: Stories about Jesus are found in the New Testament of the Bible. Say: The word gospel means good news! Ask: What are the names of the four books of the Bible that make up the Gospels? Say: We find our story in the Gospel of Luke. Our two travelers walking from Jerusalem to Emmaus, were followers of Jesus. As they walk along, an amazing thing happens – they meet the risen Christ! Ask: But do they recognize him? Do they “see” him? Read the Scripture together, verses 13-35. Have you ever heard the expression “I’ll believe it when I see it”? Ask: Can actually seeing something help you to “believe” it? Say: I have a piece of paper here with a hole in the middle. (Show paper w/ hole in center.) This hole is exactly the size of a penny. (Show the penny in relation to the hole in the paper). Say: Maybe you have to see it to believe it. Do: Demonstrate that it is possible! Ask for an assistant to hold the quarter coin for a moment. Fold the paper so that the folded edge goes through the center of the hole. With two hands, hold the top outer corners of the paper so the hole (and fold) is at the bottom edge. Push the corners inward. Ask your assistant to drop the coin into the paper. The coin will easily fall through the hole. Say: This was a case where seeing helped you believe something – that I could fit a large coin through a small hole. But what about our two travelers – they saw Jesus but they didn’t recognize him at first. So seeing wasn’t enough to help them. They needed to not only see, but also to recognize – to realize who was in their presence – that it was the risen Christ! Say: At this time we’re going to be doing some experiments about our eyes and how they work with our brains to help us see. We will be discovering about how we view objects around us. There are several stations set up for us to take turns visiting. You will have a worksheet to fill out to record your experiences at each station. We will stop and talk about our findings at 10:17. Demonstrate the noise-making device. Students will go to the next station when they hear that noise. Ask the Shepherd to help you form groups with two students in each group. For 1st &2 grade: Maximum of 4 groups. For 3rd grade and up: Maximum of 5 groups. Form groups of three if needed. Have groups spend 3 minutes at each station and rotate to the next station on your signal. Encourage students to fill out their worksheets. Stop the experiment phase with enough time for discussion. Station 1: (Draw a Mirror) The mirror shows a backwards image of the curvy line you drew. It was hard to trace your line because your brain is not used to telling your hand what to do in reverse. Station 2: ("Magic Eye” puzzles) This 3-D picture process works because of what’s called “binocular disparity” – our eyes each see a slightly different perspective. This affects the way our brain interprets depth. Station 3: (Visual Puzzles) Your comments will vary based on the puzzles chosen. Station 4: (Your Blind Spot) We all have a blind spot – a place on your retina that does not have any receptors to light. You noticed your blind spot when the dot or the cross disappeared from view. In the experiment with the line across the card, there wasn’t any break in the line where your blind spot would be. This is because your brain “fills in” the blind spot by using surrounding information – the line. Station 5: (Color Wheel) When you spun each top your eyes combined the colors – so a red and yellow disk will look orange, a rainbow colored disk will appear white, and a black and white disk will show various colors. (No one is quite sure why this happens). Station 6: (Dot Pictures) Your brain tries to interpret what your eyes are seeing. Your eyes see a bunch of dots but the brain says – but what is that? To help decide, your brain is also using past knowledge. Say: So let’s apply what we’ve learned about how we see and recognize objects, to what happened to the two travelers on the road to Emmaus. Say: What if you were on your way to school, and Jesus was suddenly walking with you. Ask: Would we recognize him? Do: Share an example from your life of a time when you didn’t recognize – until later – Jesus present in your life. Say: The two travelers finally recognized Jesus when he broke the bread. Say: I like the significance of that! At the Last Supper Jesus had told his disciples to remember him when they broke bread! Here, Jesus was giving them another reminder about breaking bread together! Say: Jesus wants us to see him! The Bible can help us to recognize Christ. So if we work at it, if we train our eye, and our mind – because remember your eyes work with your brain – we can get better at “seeing” Jesus! Use a story Bible (showing any pictures as you read) or paraphrase the story. Forego the use of a worksheet for non-readers. Have an adult for each group of students to help them at each station. Reduce the number of stations. Choose the stations that you think will be more challenging to your older students. Give students supplies to create their own color wheel combinations. Rice, George F. “Active Humility.” Dr. George’s Science Web. 2001-2010. Web. "The Impossible Hole Secret." Puzzles.com. 2001-2007. Web. "3-D Viewing Instructions." Magic Eye. 2014. Web. “Magic Eye Image of the Week.” Magic Eye. 2014. Web. Van Wagner Childs, Anne. God's Miracle Eye: Best-loved Bible Stories in 3-D.
Chudler, Eric H. "Colors, colors." Neuroscience for kids. 1996-2014. Web. Rice, George F. “Puzzle Power.” Dr. George’s Science Web. 2001-2010. Web. "Visual Puzzles." Puzzles.com. 1995-2013. Web. “Science Snacks: Blind Spot.” The Exploratorium. 2014. Web. "Jacques Cousteau in Seashells." The Exploratorium. 2014. Web. What to do if links are dead? Get creative and search! For station 3, search for "stroop test" or "color word test"
If all fails, click on the word Option (found at bottom right of this post) and select "Report Reply" and let us know which link does not work. Copyright 2003 First United Methodist Church, Ann Arbor, MI. I loved this workshop, and the kids did too! For the "Color Wheel" station we followed the instructions on a "Sick Science" youtube video (#182 Disappearing Color Wheel). For the "Dot Pictures" we used the pixelated Abraham Lincoln from about 1973 (originally in an article in Scientific American) and a close-up from Georges Seurat's pointillistic "The Circus Sideshow". Thank you, Carol, for such an imaginative and well-crafted workshop! (Done 6 years ago. Not used in 2008.) It’s hard to recognize Jesus. Optical illusion and slight of hand magic tricks open discussion on how things are not always what they appear. To understand that sometimes we have a hard time recognizing Jesus in our lives. To know that having the Bible opened up for us allows us to grow in faith. For scripture - see above. Practice the magic trick; set it up for the start of class. Start by telling everyone that you want to perform a magic trick. Point out the three film canisters in front of you on the table. Say: If you can guess which one of these containers has coins in it, you can keep the money. See, the money is in this container. Give one of the film canisters a shake (executing the trick) so that everyone can hear the rattling inside. Say: Now I'll mix them up so keep an eye on them. Rearrange the canisters—awkwardly—so that anyone watching this trick closely can keep an eye on the one with the coins. Challenge someone to point to the one with the money. Pick up the one they pointed to and shake it vigorously. They are wrong, of course. Say: This is the right one. Pick up another (again executing the trick) and give it a shake. If the kids seem interested (and don’t know the trick) you might try it again. When finished, show them how the trick was done. Say: Magic tricks can be fun because they surprise us. Magic tricks remind us that things aren’t always what they appear to be. Now tell everyone you want to take a class picture. Say: The characters in our Bible story, had an experience like you just did with this photograph – where the picture started off fuzzy, but then got clearer. Let’s read our story so you can see what I mean. Have the kids pass the photo around again. Say: Just as we can now clearly see our group photo, the two disciples traveling to Emmaus eventually clearly recognized Jesus. Say: Let’s do a science experiment. Have everyone gather around the table. Pass out one plastic cup and one coffee filter per child. Demonstrate how you want them to each draw a stick-figure person about 1” tall, using the provided markers. (Draw the figure near the wide part of the coffee filter). While the kids are drawing, fill their cups with 1/2 inch of water. When everyone is ready, have them place the coffee filter, wide side down, with just the edge touching the water. Ask: what is happening to the person you drew? (the colors in the black ink will separate out) How many colors do you see? Say: the scientific word to describe what you see is called chromatography. It looked to us like we drew a little person in one color but it was actually many colors combined together. This experiment shows us that we might look at something and not really see the whole picture. Say: Here is something to try. Have all the kids make a circle with their thumb and index finger. Hold the circle at arm's length. With both eyes, look through the circle and focus on an object. Without moving, close one eye and then the other. It will appear as though your hand has somehow moved when in fact it hasn’t. Say: Science can explain this because one eye is dominant, or stronger than the other. It does the job of focusing your gaze. So we can be looking at things and something surprising still happens. Place a ruler on the table with several inches hanging over the edge of the table. Fold a large sheet of newspaper to make a double sheet and spread it over the ruler so the paper lies flat along the table edge. Ask: Do you think that I can hit that ruler and make that paper go flying? (they will probably think that you can) Hit the ruler that sticks out over the edge as hard as you can. You would expect everything to go flying but the paper holds the ruler in place. Say: the paper didn’t move because there is actually about two tons of air pressure holding it in place. The air over the newspaper is pushing down at 15 lbs per square inch of weight on every inch of paper. No wonder it wouldn’t budge. Another example of how things aren’t always as they appear. Ask: Is it sometimes hard to recognize Jesus in your life? What can keep us from seeing the risen Christ? In what ways are the hidden Christ revealed to us? Say: Sometimes we can see God in our lives by reading the Bible. When they were walking to Emmaus and Jesus joined them (but they thought he was a stranger) how do you think the disciples felt when Jesus was explaining the scriptures to them? (later they described the feeling as though their hearts were burning) I think it meant they felt reassured of the truth of the Bible. So reading the Bible and having the Bible opened to us helps us grow in faith. When it’s time to wrap up, say: In closing, remember that hidden things can be revealed to us – whether it be the meaning of a Bible story or the realization that Jesus wants to be a part of your life journey. Remember the verse in our Bible story: “Then their eyes were opened, and they recognized him” Luke 24:31a (NRSV) Ask if anyone would like to lead the group in prayer. Say a prayer yourself if no one volunteers. A suggestion: Thank you God for sending your Son, Jesus. Help us to recognize you in our lives. Thank you for traveling with us through our journeys. Amen. Hulbert, Carol. "The Walk to Emmaus – Old Science Lesson." Feb 2002. Place URL where lesson found inside angle brackets<>. For scripture and objectives- see above. Round up extra help for this workshop. It will take at least 3 adults- one to paint feed, one to wash feet and one to work with the waiting kids. Fill the buckets with warm water. Set up the classroom for the feet painting: spread the table covers and place the banner on top of the table covers. Have the table covers stick out around the edges to catch any “extra” footprints. Place a chair at each end of the banner with trays, paints, sponges, buckets of water & towels by each chair. Ask for any prayer requests. Ask if anyone would like to lead the group in prayer. Be prepared to say a prayer yourself, working in prayer requests. Use the Lord’s Prayer as the ending. A suggestion: “Dear God, help us to try to recognize Jesus in the actions and people we see each day. Help us to remember that Jesus walks with us always as we learn about Him and God. (End with everyone joining in on the Lord’s Prayer.) Amen. again, because you thought he/she was a friend of yours? Say: Sometimes you are right and sometimes you are not. Today’s story is about a time when some of Jesus’ disciples did not recognize him at first, but then later they realized they had completed a journey with him! Say: The word Gospel means “good news.” Jesus brings us good news about God’s love for us. Distribute Bibles. Have everyone find Luke 24:13-35 in the Bible. If this is a week early in the Rotation, read the scripture together. After the first week of the Rotation, ask the students if they can tell you the story. Have them check their Bibles for accuracy. Does anyone know the names of the first four books of the New Testament? Say: Our Bible is like a library. It is filled with 66 books. We find the story about the Walk to Emmaus in the book of Luke. How would you feel if you recognized Jesus as the person eating a meal next to you? What about seeing Jesus in other people? Do you suppose that is possible? Say: When they recognized Jesus, the disciples were helped along in their journey of faith – they knew that they would believe that Jesus was the Son of God. Say: Our project today will be to make a banner that will hang here at church. It will have some words from our story. [Refer to the easel.] When we see this banner hanging here at church we will remember that we are on a journey – a journey to grow our connection with Jesus. Jesus is always walking with us. The kids will be making a banner with painted footsteps to represent their walk with Jesus in their faith journeys. The banner will be laid out on the floor with a chair at each end of the banner. At one chair will be paint, paint trays, sponges, and at the other chair will be a bucket with water, soap, and towels. The teacher and the Shepherd will help each child paint his/her feet for the banner. Have the child sit in the chair, removing shoes and socks, then using a sponge, dab the paint onto his/her feet while sitting down. Once the feet are ready, help the child stand on the banner and begin walking – try to have him/her walk from one side of the banner to the other (if there is enough paint on his/her feet!) When the child gets to the other side, he/she will sit down and an adult will help him/her to remove the remaining paint. Have him/her put on shoes and socks away from the chair so you can prepare another child to do the painting. Use the easel to play “Hangman” with simple words from the story (such as “Jesus”, “eyes”, “seeing”, or “opened. Talk about just seeing blanks as the puzzle is started, but how you come to “see” the word that fits in the puzzle. Discuss faith in Jesus as being a belief in something, even when we don’t actually see Jesus. Have the students sequence the story using the line drawings provided. Play a game of Concentration with the duplicate line drawings. Find Emmaus on the map in the back of the purple Bibles. For 3rd graders (maybe 2nd graders?) another form of Concentration that matches questions and answers. The Children’s Illustrated Bible. Retold by Selina Hastings/illustrated by Eric Thomas. Copyright 1994, Dorling Kindersley. NIV Adventure Bible. Copyright 2000, Zondervan. Martin, Melissa and Debbie Houghton. "The Walk to Emmaus - Art." April 2008. Place URL where lesson found inside angle brackets<>. Invite a member of the clergy (consider asking a retired minister in your area if your pastor can't make it) to attend this workshop to answer questions. Create a list of possible questions about Communion. If needed, stop in the kitchen and collect a tray or cookie sheet, a plate, and towels. Separate the one pound loaves of bread dough into 3 “servings” per loaf. Place these on the tray and cover with a towel. Have this tray & the Wet Wipes handy to the low table. Set the un-sliced loaf of bread on the plate. Cover with a towel. Place the plate on the low table. Set out costumes – to avoid a mass digging thorough the costume box. Say: Let’s begin with prayer. How many of you walk to school? How many of you can walk to go a friends house? What about just taking a walk, do you like to do that? Say: We are learning a Bible story about two people who were walking from Jerusalem to the town of Emmaus on the very first Easter evening. Along the way, an amazing thing happened – they met the risen Christ! Let’s read about this story. Where in the Bible would we read a story about Jesus, in the Old or the New Testament? What good news do we learn about in the Gospels? Say: It is important to celebrate because it shows God’s power over death. Jesus is alive! Because of this we can know that we now have a chance of a new way of living. Jesus died for us – so that our sins could be forgiven. Say: Isn’t it wonderful to know that God gives us a second chance even when we mess up? Have everyone find Luke 24:13 in the Bible. Say: Part of what we learn in Sunday’s Cool is preparation to be together in worship. To help us prepare for that time, after we read scripture we are going to say the words that are said in worship after the scripture is read. Be ready to say: “thanks be to God” after we finish reading verses 30 and 31. Have them to read together Luke 24:30-31. Finish the story by Saying: The travelers were amazed! The stranger was Jesus! He was alive! So Jesus’ friends returned to Jerusalem, in the dark, to tell the others about meeting Jesus along the road to Emmaus. Say: Today we’re going to be talking more about Communion. But first let’s act out some of the things that happened on the very first Easter Sunday, the day that Jesus was raised from the dead. Let’s put on costumes. Allow everyone to put on a costume. Gather everyone sitting on the couches and chairs in the room. Say: On the very first Easter, Jesus was raised to life from the dead but at first, his disciples didn’t know about this. Jesus’ disciples were still thinking that Jesus had been killed and was dead. Ask: How would they have been feeling? How would your faces look if you were sad? Encourage everyone to act sad. Say: Imagine that you are the two followers of Jesus who are traveling slowly down the long, dusty road to Emmaus. Say: Cleopas turned to his friend and said, “it seems like only yesterday when we were welcoming Jesus into Jerusalem with palm branches.” The second traveler said, “yes, they treated him like a king. But now…he’s been killed.” His thought trailed off. They walked in silence for a few moments, each lost in their sorrow. At this point stop and Say: Now form groups of two. I want one of you to repeat after me. The second person should respond the way the travelers on the road might have. One group member repeats this and the other responds appropriately. Say: Suddenly Cleopas and his friend had their thoughts interrupted as they noticed that a stranger had joined them in their journey. Have the students form groups of three. (You and the Shepherd may need to join a group.) Pick one member of each group to be Jesus. Have everyone keep on walking in place. Have the stranger (Jesus) in each group repeat this question and have the other two respond with disbelief. Say: The disciples began to explain to the stranger about what had happened and about their hopes that Jesus was the Messiah. Then the stranger interrupted, “don’t you know what the scriptures say?” And Jesus went on to explain what the Old Testament had to say about the Messiah. “It’s ok,” the hidden Jesus, explained. “He had to die so that all could have new life.” Jesus was opening the Bible for them; helping them to understand. And while he did, the disciples felt their hearts burning. Say: Now I’d like each of you in your groups to take one minute to share what your favorite Bible story is. Have everyone go and sit down together around the low table. Say: So, they found themselves together at table. And when the stranger took bread…[take up the loaf of baked bread] … blessed and broke it…[break the bread] …their eyes were opened. It was Jesus! And he disappeared. Say: Cleopas and his friend were astonished to discover that the stranger had been Jesus! Do you suppose this ever happens to us - that we don’t recognize Jesus in our lives? Break the loaf of bread into bits and share it with the students. Say: We just enacted The Walk to Emmaus, a journey for two disciples. Ask: How is this story like journeys we take in our lives? What can help us recognize Christ on our journeys? Say: Earlier we’d said that when Jesus broke the bread it reminded us of Communion. 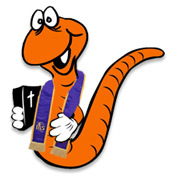 We have Rev.___ here to help answer some questions about Communion. Say: Jesus promised he would always be with is on our journey through life. Remember the verse in our Bible story: “Then their eyes were opened, and they recognized him” Luke 24:31a. Have each student wipe their hands with a Wet Wipes or have them use Hand Sanitizer. Have them place a portion of bread dough in a loaf pan and put the pan into a zipper storage bag along with the baking instructions. Say: Take home this loaf of bread and follow the directions for baking it. Break the bread with your family. As you break the bread, tell them the story that you have learned today. Hickman, Hoyt L. United Methodists and Communion: Some Questions & Answers. Nashville: Abingdon Press, 1998. On-My-Own Reader Bible. Cincinnati, OH: Standard Publishing, 2004. “This Holy Mystery: A United Methodist Understanding of Holy Communion.” The General Board of Discipleship of The United Methodist Church. 2003. Hulbert,Carol. "The Walk to Emmaus - Drama." April 2008. Place URL where lesson found inside angle brackets<>. Hear the story from three storytellers – the woman at the tomb, and two travelers who met Jesus. The students come to understand the concept of being on a journey with Jesus as they take a “walk along the road to Emmaus” (or a jaunt through the church building). [Note: 1st – 3rd graders visited this workshop.] For scripture and objectives - see above. NOTE: This workshop requires one “workshop leader” and three different storytellers. One storyteller is dressed as the woman outside Jesus’ tomb. The other two storytellers represent the travelers who met Jesus on the road to Emmaus. The workshop leader handles other duties including prayer, Bible story reading, discussion, and guiding the students in the activities of the lesson. A Shepherd will also be present with the children. The Storytellers should practice their story using the script given to them. The Workshop Leader should write the key Bible verse with the scripture reference on the easel. Put the sign out in the hallway outside the door to the room. Cue track 45 of the CD from the book The Humongous Book of Bible Skits. Set CD player to REPEAT. Gather everyone in the storytelling tent. Greet your students warmly, welcoming them to the Storytelling Workshop. Introduce yourself and any other adults. Say: Today we will have some special guests – visitors dressed as if from Bible times to will help us to hear our story. They will tell us about the events that happened on the very first Easter. First, let’s start with prayer. Say: It is important to celebrate because it shows God’s power. Jesus is alive! Because of this we can know that we have a chance of a new way of living. Our sins are forgiven! Isn’t it wonderful to know that God gives us a second chance even when we mess up? Today we’re going to be hearing our Bible story from several storytellers. They will tell us what happened on the very first Easter Sunday. Let’s go over to where Jesus’ tomb is, and hear from our first storyteller. Tell your story. (See script at end of lesson) When you are finished, turn the class back over to the workshop leader. Say: Thank you for sharing your story with us. Say: Let’s go back under our tent to take a look in the Bible for our story. Do: Gather everyone back under the tent. Ask: Where do we find stories about Jesus, in the Old Testament or the New Testament? Make sure that everyone has access to an Adventure Bible. Have students find the Gospel of Luke. Say: The word “gospel” means good news. It is good news that Jesus is alive! Do: Have them find the story in Luke, chapter 24, verse 13. Ask: What is the title of our story? (look in Bibles – “On the Road to Emmaus"
Do: When everyone has found the story, ask them to follow along as you read verses 13-35. It was the end of the first Easter day and it was getting dark. Two of Jesus’ friends were walking from Jerusalem to a small town named Emmaus. They were very sad because Jesus had died. As they were walking, a man began to walk with them. He asked what they were talking about. When they reached the town of Emmaus, the man wanted to keep going further down the road. The friends urged him to stay with them. “The day is over. It is dark. Please stay with us.” So the man did. They all sat down at the table for supper. The man took bread, gave thanks to God, broke the bread and gave it to them. Immediately their eyes were opened and they recognized the man. IT WAS JESUS! But then, Jesus was gone. The two friends were so amazed. They had seen Jesus alive! Say: When we take Communion – the bread and the grape juice – it is to remind us of what Jesus has done for us. Because he died, our sins our forgiven. When we share the bread and the cup of Communion it gives us a chance to recognize God as active in our lives because he has forgiven us. Say: I would like us to now pretend that we are in Jerusalem. Let us pretend that it is the first Easter. We have just heard the report that Jesus’ tomb is empty. What does this mean? Let’s go on a little journey – let’s head for the village of Emmaus and see what happens. Say: God became very involved in our lives when he sent his son Jesus to earth. Jesus came to teach us about God’s love. Do: Head out and eventually meet the two men as storytellers. The travelers tell their stories. When you are finished, turn the class back over to the workshop leader. Say: Thank you very much for visiting with us and sharing your story. Say: Let’s go back to “Jerusalem” where we can share the good news. Go back to the room by going past the Chapel and going up via the back stairs. Sit everyone down under the tent. Say: We have learned about the experience of the woman who discovered Jesus at the empty tomb. We have heard from the travelers who discovered that Jesus was walking with them. The two travelers were walking with Jesus. They didn’t realize it at first but he was there. Say: Let’s talk about our lives as being a journey that we are walking. We started our journey when we were born. We didn’t walk at first but we learned. We walked our way through preschool and kindergarten and now we’re in __ grade (fill in the grade). Say: Maybe you’ve had some sad times in your life. Jesus was there with you during those sad times. Say: Let’s practice our key Bible verse from our story. It is good to have Bible verses stored in our hearts for when we are feeling the need to remember that what happened to the two travelers can happen for us too. Say: May your eyes be opened to the loving presence of Jesus in your life this week and may you share your experiences with others. For 3rd graders and older: Have them find the key Bible verse – Luke 24:31a. Show them the scripture written on the easel. Explain that the “a” means just the first part of the verse. Have them notice that verse 31 in the Bible is longer. Crane, Amy. WT Storytelling Lesson.” 2004. Horn, Geoffrey and Arthur Cavanaugh. Bible Stories for Children. New York: Macmillan Publishing, 1980. ISBN: 978-0025540606. Story for the younger children was adapted from theheights.org preschool lessons which are no longer available on their web site. Hello! Have you come to look to see where Jesus was buried? Well I can tell you, he is not here! He is alive! I am still amazed at what has happened. Let me tell you about it. Jesus had been killed on a cross. It was a horrible way to die. We were all so sad. We were followers of Jesus and we all couldn’t imagine life without him. I saw them place his body in this cave. You know, a tomb -- where dead bodies are placed. There was a HUGE stone rolled in front of the entrance to the tomb. We were worried about that stone. You see, very early on Sunday morning, the other women and I came here to the tomb. As we were walking here we were discussing how we’d roll away that stone. You see the other women and I were coming to the tomb with spices. We needed to cover Jesus’ body with the spices. But it turns out that we didn’t have to worry about the stone – it was rolled away! Then, we saw an angel! The angel told us not to be afraid. Ha! We were terrified! Angels are always telling people to not be afraid. But then this angel told us to peek in the tomb and see that it was empty. And sure enough it was! The angel said that Jesus was alive! We didn’t know what to think. Then the angel told us to go, and tell Jesus’ other disciples that Jesus was alive. Well we snapped to attention at the angel’s instructions. We had been so shocked at finding the tomb empty. But now we had work to do – of course – to tell the others! And then… who should we meet on the road… but Jesus! He was alive! Jesus died for us so that our sins could be forgiven. What wonderful good news… meeting Jesus on the road. Cleopas: (excitedly) Hello! Have we got some news for you! Other traveler: You are all followers of Jesus aren’t you? (wait for a reply) Yes. Good, then you know about him having been killed. But, we have the best news! Cleopas: That’s right…Jesus is alive! Cleopas: (impatiently) Let me tell them. We saw Jesus! (you use, pacalm yourself, and speak more slowly) We were on the road to Emmaus, that’s our hometown. We had left Jerusalem to go home. We were so sad about Jesus’ death. Other traveler: Yes, we were just dragging along, talking about the sad events of the last few days. Cleopas: And then suddenly, there was someone walking with us. We didn’t realize that it was Jesus. Other traveler:(shaking your head) don’t know how we missed noticing that it was him. Cleopas: He asked us what we were talking about. Ha! We were kind of surprised. Where had he been that he didn’t know what had happened? I thought everyone knew! Other traveler: So we told him everything. Including the part about some of the women who had gone to Jesus’ tomb and found it empty. The women said that they’d seen angels and that they’d actually seen Jesus alive. We didn’t know what to think. Cleopas: Ha, ha. Then this stranger…it was Jesus, but we didn’t recognize him yet…he tells us that we were being foolish! (shake your head) He reminded us what the prophets had told us – about how our Savior, the Messiah, would die – not for a crime he had committed but to bring forgiveness from God. Other traveler: Well, in our traveling together we had reached Emmaus. This man wanted to keep going further down the road. We urged him to stay with us. So he did. He went in to eat supper with us. Other traveler: And that is when our eyes were opened. We saw that it was Jesus. Cleopas: Then he just disappeared. Other traveler: We were so amazed. It was Jesus! He’s alive! Cleopas: Well that’s when we realized we needed to tell the others the news – Jesus is alive! Other traveler: Come on Cleopas, we need to be on our way…to tell more people. Cleopas: Isn’t it amazing…we met Jesus on the road. (excitedly) Hello! Have I got some news for you! You are all followers of Jesus aren’t you? (wait for a reply) Yes. Good, then you know about him having been killed. But, I have the best news!…Jesus is alive! Yes! Alive! I saw him. It was so amazing. I am so excited I am shaking. I must calm myself to be able to tell you my story. (speaking more slowly) Cleopas and I were on the road to Emmaus, that’s our hometown. We had left Jerusalem to go home. We were so sad about Jesus’ death. We were just dragging along, talking about the sad events of the last few days. Jesus, whom we thought was to be our Savior, had been killed. And then suddenly, there was someone walking with us. We didn’t realize that it was Jesus. (shaking head) I don’t know how we missed noticing that it was him. He asked us what we were talking about. Ha! We were kind of surprised. Where had he been that he didn’t know what had happened? I thought everyone knew! So we told him everything. Including the part about some of the women who had gone to Jesus’ tomb and found it empty. The women said that they’d seen angels and that they’d actually seen Jesus alive. We didn’t know what to think. Ha, ha. Then this stranger…it was Jesus, but we didn’t recognize him yet…he tells us that we were being foolish! (shake your head) He reminded us what the prophets had told us – about how our Savior, the Messiah, had to die – not for a crime he had committed but for our sins…in order to bring forgiveness from God. Well, in our traveling together we had reached Emmaus. This man wanted to keep going further down the road. We urged him to stay with us. So he did. He went in to eat supper with us. He took the bread,(hold imaginary bread in your hands) said a prayer over it, and broke the bread(break your imaginary bread) …And that is when our eyes were opened. We saw that it was Jesus. Then he just disappeared. We were so amazed. It was Jesus! He’s alive! Well that’s when we realized we needed to tell the others the news – Jesus is alive!